Every year in Sandy, several groups go out of their way to give back to the community in the spirit of Christmas. For 63 years, the Sandy Kiwanis Club has done its part by compiling and delivering baskets of food and gifts to local families in need. The boxes include age-appropriate toys for the children, as well as all of the fixings for a great holiday meal. Last year alone, the group was able to create Christmas for 276 families. This year they hope to help even more, estimating to deliver 350 baskets. "My favorite part is meeting the families," Sandy Fire Office Manager Nannette Howland said last year. "They come into the fire station to sign up for the application (process), so I get to meet them and hear their stories. They're down on their luck and need assistance over the holidays. I love doing the baskets and seeing the community come together in a time of need." 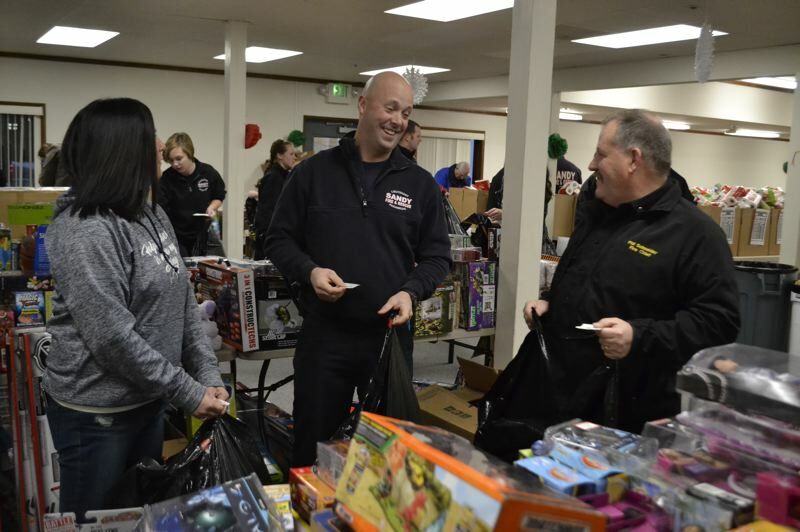 Howland receives and coordinates the applications for the program, and the Sandy Fire Department, with the help of multiple well-equipped motorists from the community, helps deliver the bags and boxes to the families every year. At 8 a.m. Friday, Dec. 21, at St. Michael's Catholic Church, 18090 S.E. Langensand Road, the Sandy Kiwanis Club will host its annual "Good Morning Santa," and begin the process of filling Christmas baskets again. All are welcome to attend and enjoy refreshments and/or help fill gift baskets for local families. The group is assisted by volunteers from the Sandy Area Chamber of Commerce and the Sandy Fire Department, but can use as many helping hands as possible. "I'm looking forward to getting all the businesses together at Good Morning Santa," said Martin Montgomery, program chairman. The baskets will be delivered the following morning, and those who wish to help are welcome to meet volunteers at the church at 9 a.m. Saturday, Dec. 22. "The program fulfills a need in the community, and without our program there would be another 300-plus families trying to get help from Clackamas County, and they're already taxed," Montgomery added. "As long as the need is there, we'll be there trying to fulfill it." Monetary contributions for purchasing fresh foods and additional canned goods can be sent to Kiwanis Community Christmas Baskets, P.O. Box 1261, Sandy, OR 97055. For more information, contact Martin and Shannon Montgomery at 503-894-4382.